Home / Blog / Blessing Israel / It’s all about the ROOTS? How many times do we hear people speaking of roots when referring to their family tree—their lineage? A root can mean something that is an origin, a source, the base, the underlying support or foundation, or the heart. Just as our roots speak to each of us of our very existence, the root system of the olive tree is the very foundation, or the life-blood of its existence. Without healthy roots there is no tree, no fruit… no cycle-of-life. The root system of the olive tree is particularly interesting. 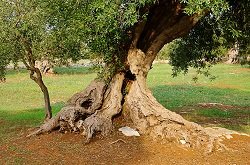 While many other tree species send their roots deep into the ground, the olive tree attributes its resiliency to a shallow, wide-spreading root system. This allows the olive roots to collect water from the fast-drying topsoil, ensuring that the tree gets enough moisture to sustain it in its native, arid climate. Although the olive tree roots are found close to the surface, this tree is fascinatingly drought-tolerant and can survive on minimal amounts of water for days, and even weeks. It takes a strong, established root system to sustain the life of an olive tree in the Negev Desert. But through advanced, innovative horticultural practices, trees sponsored through My Olive Tree are thriving in the Negev today! In order to do our part to help bring Isaiah’s biblical prophecy into its fullness, My Olive Tree knows that it’s all about establishing roots. In 2013 we began to focus our efforts on the Negev Desert and entered into an exclusive partnership with the Israeli Defense Forces. Through this partnership, My Olive Tree is now sponsoring the planting of olive groves on army bases throughout the Negev Desert—aptly named Peace Groves. With the most advanced irrigation technology available today, the My Olive Tree Peace Groves, located in the Negev Desert, will establish olive trees with strong, thriving root systems—well able to sustain them during harsh environmental conditions for years to come. Through this concerted effort, My Olive Tree is helping to boost the local agricultural economy in that war-torn area by providing jobs through continued harvests, while at the same time blessing the Israeli Defense Forces with a tangible gift of peace. When you sponsor a tree with My Olive Tree, your single gift will not only purchase and plant the tree, but also provide for the irrigation to help establish a strong, healthy root system. 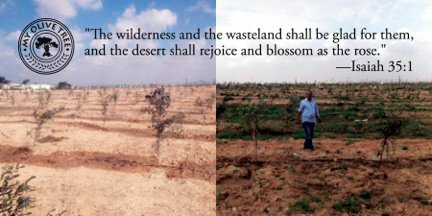 With your sponsorship, you are not simply planting a tree in the desert, you are planting a foundation of life that will truly impact the Nation of Israel for generations to come—harvest after harvest—helping to fulfill Isaiah’s prophecy… the wilderness will rejoice and blossom.